A visual processing disorder is when someone does not SEE the same as someone else. This disorder is difficult to diagnose, because children suffering from this disorder are not aware of it. However, clues are provided by a child at an early age. I knew there was something different about my youngest daughter. She would always take the black crayons and black markers to use in her writing. She would always sit too close to the television. She always had trouble with keeping her things in one place. She was always touching things. A real indication she had a problem was when she read. Her reading during the day fluctuated. She was not consistent in her reading. Her writing was horrible to read and her math was not much better! At first, I thought she might have dyslexia. Later, I learned she had photophobia (how the eye processes visual stimuli), in addition to having glaucoma and a visual processing disorder. My daughter was not diagnosed with having glaucoma, until the age of 10. Her condition of living with photophobia was not diagnosed until the age of 12. As for having a visual processing disorder, she was diagnosed with this disorder until she entered college. Perhaps, she was diagnosed with having a visual processing disorder, rather than photophobia, because photophobia is not a known condition. In order to be diagnosed with this disorder, one must see a neuro-ophthalmologist. Children do not normally see a neuro-ophthalmologist. It is much easier to obtain a diagnosis of having a visual processing disorder through a children's neurologist. As a proud parent, my daughter will receive a bachelor's degree in criminal justice and has applied to graduate school. All of this would not have been possible, for a child who never made the honor roll in high school and was thought of as being 'dumb,' if her mother had not taken the necessary steps in helping her younger daughter to get accepted into a college program and actually graduate with a bachelor's degree in criminal justice. 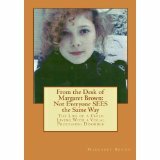 The book, "From the Desk of Margaret Brown: Not Everyone SEES the Same Way," is a true story of a child living with a visual processing disorder.